Love it! I love that they are baked! 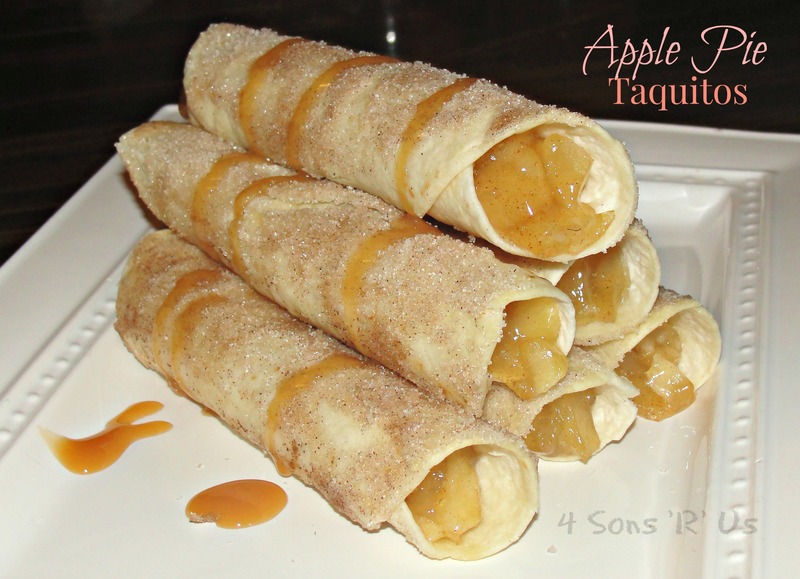 My hubby loves anything apple so these will be a big hit at my house! Thanks for sharing! Found you on Full Plate Thursday blog hop! They really, really are Julie. This looks great. Happy FF! I LOVE this idea, so fun! And they look really tasty too, especially with a little ice cream – yum! It’s fun and I haven’t been able to stop thinking about all the other options there’d be for these. Pumpkin Pie anyone? With a little pumpkin pie spice and a hint of nutmeg? I like the way you think Rita! Or a thin layer of cream cheese spread on the inside of the tortillas before adding the cherry pie filling? For a cheesecake style? Oh, I agree with Michelle – these are SO fun! good word… taquitos 🙂 Thanks so much for sharing them with us on Fiesta Friday! What a great treat that we will just love! Thank you so much for sharing with Full Plate Thursday and have a great day. The photo looks to me like there is something spread onto the tortilla before the apples…cream cheese maybe??? It does kind of look like that, doesn’t it? There’s nothing spread on them so I’m guessing it’s the flash on the inside of the tortilla. A cream cheese spread sounds like it might make a yummy addition though! Hi, did I do something wrong. I brush them in butter, rolled them in the sugar mixture. but they came out greasy and sticky. Tasted very good. No matter where I put them, out in the open, covered them up, covered in refrigerator, etc. they were still greasy and sticky. What did I do wrong. Want to make them again. Other than the fingers getting all messed up, they are great! Thank you. I know they’re a bit messy 😉 as for them being greasy/sticky I’ve never had that happen. The tortillas should soak up the butter. My suggestion would be to try using less butter. You don’t *have* to use the entire amount, just a little to coat for crunchiness and so that the cinnamon and sugar stick. I would use a gluten-free flour tortilla before trying these with corn tortillas. Look great going to try them soon. Maybe some with cream cheese and some without. I’m really anxious to hear how they turn out with the addition of some cream cheese! Oh no, Jo Ann! I’m sorry to hear that. We’re your tortillas fresh? I’ve found the less fresh mine are the stiffer, and harder to work with, they get. I fix that by putting them on a plate in the microwave, laying a damp, wring out paper towel overtop and nuking the, for a few seconds. They sound good,but I prefer fresh apples, don’t like canned apples to sweet for my tastes. Could I cook the on stove with some apple juice the add some corn starch to thicken before putting them in tortillas? Sure, any kind of homemade pie ‘filling’ would work. You’re still going to get a good amount of sweet in every bite from the cinnamon and sugar outer coating. Would this work with uncooked tortillas? They would, but I would first cook them in the pan according to the package directions before following the recipe. If you don’t they will probably still taste ok, but they won’t get crisp. Do these need to be served warm? How long could they sit out at room temperature for serving to a crowd before getting soggy or unappealing? Thanks! Susan, I would recommend serving them warm. We’ve never had them last more than 30 minutes after being set out and they were always good up until that point. If you’re trying to do food prep in advance they could always be assembled before hand and baked right before you’re ready to serve. Hope that helps! I’m so glad you liked them, Darlene. Thanks for taking the time to let us know! I would like to try this recipe at a later date. Can it be printed out? Kathy, at the bottom of the post, along with the share buttons, is a print icon. Click on that and you can print from there. I have made the apple pie filling with cream cheese in a pie shell. Rollout pie dough 12 to 14 inch round. Spread cream cheese in the middle, place pie filling on top of cream cheese fold pie shell over filling leaving a small opening in the middle bake like you would a pie. it is quick and super good. I have used apple, peach and cherry filling in pie and all have been great. Yummy, Carol. Thanks for sharing! I have a basket full of apples. How do I make the home made filling? OH MY, THESE SOUND GREAT. I WILL MAKE AND PASS THE RECIPE ON TO MY GRANDDAUGHTER WHO IS A SOUS CHEF. Love this recipe – it has the same ingredients. I usually make Apple Pie Enchiladas. I use the canned apples and flour tortillas but use a mixture of melted butter, cinnamon and sugar that I pour over the enchiladas. Then bake then in a 350 oven for 30 minutes. Well … I know what I’m trying for dessert tonight! One of the first weeknights everyone will be home to sit down to dinner. Read all the comments here so I’m not 100% sure of who’s iteration I will use 😊. Thanks for the recipe and to everyone for their add ons! This such a ‘home-y’ dessert, perfect for sharing around the family table!